Discussion in 'Mayberry Lounge' started by Make-U-Tap, Aug 19, 2015. As Independents go,he has a good start. Deez Nuts is Jeb Bushes undercover name - dudes been puttin in work on the down low for some time. The guard behind them trying not to laugh is the best. He knew where it was going right away. Flawless technique on the People's Court. And Harvey, you are wrong! The key is sticking to your plan. One can only say "Dee hit em" so many times before your adversary takes the bait! 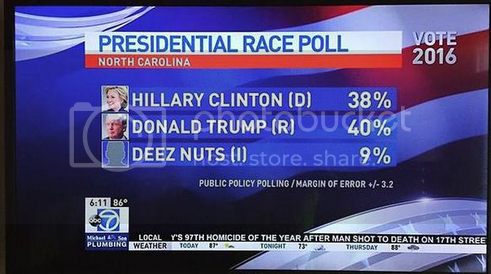 Deez Nuts is by far the best of those 3 candidates. U.S has become a circus lol. Despite that Johnny come lately thread, just remember in this political season...I was on Deez Nutz first.